Ok..so I was about to turn 40. Big deal, right? I grew up believing that on your birthday you should be queen for the day. And, on a milestone like 40…well, I felt like it should be MY week! I couldn’t think of a better way to spend “my week” than on 2 wheels. I’ve read about the fly and ride programs through Harley and figured that would be the best way to celebrate this milestone. After a little research on Harley’s fly and ride locations, I chose Las Vegas as a starting point. One of the best vacations I ever had was riding along the west coast of Florida. We had no plan in mind, no real destination, just riding south for 2 1/2 days then turning back towards South Mississippi, where I call home. So, I figured the best way to do this Las Vegas trip was to make as few “plans” as possible. Other than planning the flight to Las Vegas and dinner and a show for the night of my birthday plus bike rental reservations, we had no real destination or plan in mind for this trip. I like the freedom of not having a plan. But not having a plan means…I did little research on weather conditions. (note to self….check the weather conditions BEFORE traveling next time). I live in the South. I am used to riding year round. I guess it never occurred to me that it gets really, really cold in other parts of the world. So, here it is December…and we’re flying to Vegas in 50 something temps. Not bad, right? Even though I enjoyed the first day of walking the strip, I was very anxious about our plans to visit the LV Harley Shop the following day to pick up our chariot for the next couple of days. I awoke early the following morning, eager to get started on our journey. When we arrived at the Harley shop on that very chilly morning, our Electra Glide was polished and ready for whatever adventure we may be called to. The folks with Fly and Ride gave us a map that included several options of destinations. Since I had never seen the Grand Canyon, that sounded like a great choice. When I told the Harley rep that the 250 miles to the Grand Canyon sounded like fun, he said “you do realize it will be FREEZING there right? Maybe you should consider the trip to Los Angeles instead”. Ok…it couldn’t be that cold, right? We’re talking about 250 miles of desert, right? Somewhere along the way, the weather decided to become unseasonably cold. Thus begins our adventure. On a side-note, I have to admit that I did this trip on the back of the bike. Yes Ladies…the back. 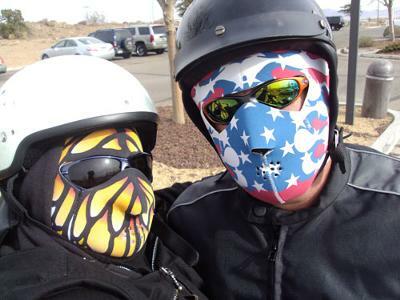 Even though I am the president of a local ladies’ ride club and pride myself on spending time behind bars, I also love the intimacy of riding two-up with my best friend (my husband). Plus, on the back, I can take lots of pictures. We left Las Vegas and made our way through Hoover Dam. It was probably hovering around 40 degrees at that time. I was completely fascinated by this incredible man-made sight. And, I’m quite certain I enjoyed the scenery around me more than those folks trapped in the cages passing us by. From Hoover Dam, we hit the desert highway headed towards the Grand Canyon. The sights and smells I experienced were far more different than anything I was used to seeing on a daily basis. There’s not much more exciting to me than experiencing something new. We were a bit chilly on this ride, so every stop we made found us adding a piece of clothing. When we stopped mid-day to take another look at the map, we realized that there were very few towns in between Vegas and The Grand Canyon, so we might better consider using the P word---Plan. We needed a plan for a hotel. I called and made reservations to stay in Williams, AZ, which is just 60 miles south of the Canyon entrance. When we stopped to make the reservation, we had about 90 miles or so to Williams. I figured that 90 miles would put us in Williams just after dark. I didn’t realize it can go from daylight to dark in about 10 seconds in Arizona. As quickly as the sun went down, so did the temperatures. Just before the fierce cold of the night hit me, I saw the most incredible moon I’ve ever seen break the horizon. Once that gorgeous moon got high in the sky, it became miserably cold. After riding (and freezing) for what seemed like an eternity (although it was probably only 40 miles or so), we pulled over at a gas stop on Route 66 to warm up and get coffee. Once we felt we warmed up enough to move on, we put almost every piece of clothing on we brought with us. Not to mention, we also purchased extra face masks in the store. Once we were bundled up in at least 5 layers, we were back on the bike headed east to Williams. I remember looking over my husband’s shoulder one time to read the temperature gauge. Bad idea! It read 12 degrees. Just the mere thought of 12 degrees made me shiver even worse. Thankfully, we made it to Williams with our sanity still in tact. We wound up in a lovely lodge style room equipped with a hot-tub and fireplace—just what the doctor ordered! After a wonderfully warm night indoors, we awoke to frigid temperatures outside. When we told the owner of the hotel our plans to ride up to the Canyon, she suggested we catch one of the buses. But, crazy as it sounds, we rented a bike, we were going to use it. It’s all about the adventure, right? So, after the sun came up and thawed some of the ice out a bit, we bundled up again and headed north to the Canyon. Although I was again shaking the back of the bike from shivering on the ride up, I can not describe what I saw when we stepped out on the ledge to overlook the Grand Canyon. It was far more awesome than I expected. Words and photos simply don’t do it justice. I think I’m even more shocked though, by the fact there was snow on the ground and I had actually ridden a motorcycle there. What was I thinking??? Unfortunately, the temperature had not changed much the 3rd day when it was time to make our way back to Vegas to return the bike. By this time, we were becoming a little more acclimated to the weather. We were able to rider longer distances in between warm up stops. However, as we got further west, it was interesting to feel and experience the difference in temperature as we cruised to lower elevations. During the course of this journey, I saw some incredible sights and experienced things in ways that people who live their lives driving in cages will never do. Would I do it again? In a heartbeat! (Okay, so maybe I’d wait until Spring next time). The place we stayed in Williams is called The Lodge on Rte 66. And I absolutely recommend it. Wonderful people and wonderful hospitality. I would love to go back for another visit. It's a great town where you never meet a stranger. That sounds like such a great adventure. I was wondering if anyone out there has ever done the fly & ride in Alaska. My 30th anniversary will be next year and I think this would be the best of both worlds. Amazing to hear you talk of riding the roads. I have been to the grand canyon and it is hard to see it in a picture!! Did you ride across the painted dessert also?? Incredible and right by there. I have to admit I did in a car and still had a great time... But I am glad to see you enjoying your hobby and listening to you share you adventures!! Really good to read your story all the way over here in Australia. It's always great to get to know a little about riding in other parts of the world. You make the Grand Canyon sound even more fantastic than it looks in pictures. One day I might just get to ride in your part of the world. Hi There! It sounds like you had a great time even combating the weather! I have been planning a trip to the Grand Canyon too. Like you, I really don't do too much planning or I just go crazy, but could you tell me the name of the place you stayed in Williams. Would you recommend it? It sounds like a perfect spot to stop. Great Story, and Well told! You are brave and crazy people, but what an adventure you had!